Summary: A 72-year-old man underwent cerebral angioplasty and stenting for a high-grade eccentric atherosclerotic stenosis (93%) of the right intracranial vertebral artery. The lesion was sufficiently and smoothly dilated very easily with the use of a highly flexible, balloon-expandable coronary stent. No complications occurred during or after the procedure. This therapeutic option may prove to be a safe and useful means to resolve an intracranial atherosclerotic stenosis. For some time, metallic stents have been used in the coronary and other peripheral vessels with a remarkable reduction in procedural morbidity (1), whereas it has only been in the past few years that percutaneous transluminal cerebral balloon angioplasty (PTCBA) of the intracranial artery has been reported (2–6). Although some studies have produced good results (2, 5), others have described a high morbidity or mortality rate after intracranial PTCBA (3, 6). We describe a case in which elective cerebral angioplasty and stenting (CAS) resolved a high-grade atherosclerotic eccentric stenosis of the intracranial vertebral artery very easily and without complications. A 72-year-old man with an unruptured aneurysm in the right middle cerebral artery and total occlusion of the left vertebral artery was referred to our institution for endovascular treatment of a high-grade (93% diameter, 4.5-mm length) eccentric stenosis of the right intracranial vertebral artery (Fig 1A and B). Although it was hoped that the aneurysm could be surgically clipped, the intracranial high-grade stenosis and total occlusion in the posterior cerebral circulation indicated too great a risk for general anesthesia. Therefore, vascular reconstruction of the intracranial stenosis, if possible under local anesthesia, was indicated to reduce the risk. 72-year-old man with an unruptured aneurysm in the right middle cerebral artery and total occlusion of the left vertebral artery. A, Lateral view of the right vertebral arteriogram before stenting reveals a high-grade eccentric stenosis (arrow) with 93% stenosis and 4.5-mm length. Scale bar: 10 mm. B, Anteroposterior view of the right vertebral arteriogram before stenting. 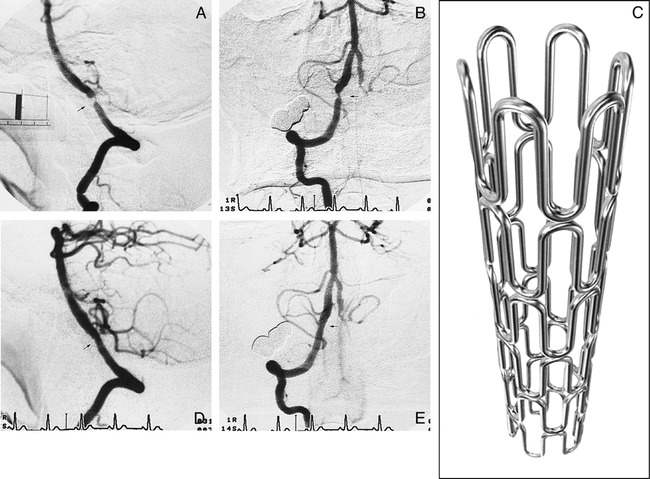 C, Illustration shows the gfx stainless steel stent, which was implanted in the intracranial vertebral artery. This stent measures 12 mm in length and can be expanded to up to 4 mm in diameter. D and E, Right vertebral arteriograms (D, lateral view; E, anteroposterior view) after stenting show smooth and sufficient dilatation of the lesion and no residual stenosis (arrows). We attempted to use a highly flexible, stainless-steel (316L) stent to dilate firmly the lesion, as arterial dissection or abrupt closure was possible with this extremely eccentric lesion. The Ministry of Health and Welfare in Japan has approved the gfx stent (AVE Inc, Santa Rosa, CA) for the coronary artery, but has not yet approved it for the cerebral artery. The president of our institution, however, permitted us to use the coronary stent for the cerebral artery in this patient, after the patient gave informed written consent for CAS. We administered 200 mg of ticlopidine per day starting 1 day before CAS. The stenosis rate was calculated from angiograms before and immediately after CAS by using the North American Symptomatic Carotid Endarterectomy Trial (NASCET) criteria, which compares the diameter at the site of greatest narrowing with the diameter of a normal artery distal to the lesion. The patient underwent CAS under local anesthesia. A 6F guiding catheter (MR2, Medikit Co, Tokyo, Japan) with 0.064-inch inner diameter was selectively placed via a femoral arterial route into the right vertebral artery. Low-molecular-weight dextran (1000 mL per day) was started 1 hour before CAS and continued until the next day. Heparin (10,000 U) was administered intravenously to avoid thrombus formation during the procedure, and isosorbide dinitrate (2.5 mg) was injected into the right vertebral artery through a guiding catheter to prevent balloon catheter-induced vasospasm. A 0.014-inch guidewire (Dasher-14, Boston Scientific/Target Therapeutics, Fremont, CA) was navigated across the stenosis. The very flexible balloon catheter (Ranger, Boston Scientific/SCIMED, Maple Grove, MN) with a 2.5-mm diameter and 20-mm length was guided over the wire and then inflated twice at 6 atm for 60 seconds to predilate the lesion. The balloon catheter was replaced by the balloon-expandable coronary stent (gfx) with a 3.0-mm diameter and 12-mm length (Fig 1) with the 0.014-inch 300-cm exchange guidewire (Taper-14, Boston Scientific/Target). The stent was deployed at 9 atm for 15 seconds. The lesion was sufficiently dilated very easily (Fig 1D and E), and the stenosis was reduced from 93% to 0%. No complications occurred during or after the procedure, which was finished within 60 minutes. The patient received 200 mg of ticlopidine per day as the poststent therapeutic regimen to prevent stent thrombosis after CAS. Two days later, he returned to the presenting hospital to undergo surgical clipping of the aneurysm. Anticipation of the likelihood of a successful procedure is required before performing PTCBA. As previous studies have reported (4, 5), a short (< 5 mm in length) concentric or moderately eccentric intracranial atherosclerotic lesion is the most amenable to PTCBA, but PTCBA for a tubular lesion (5–10 mm in length) or an extremely eccentric lesion may lead to higher complications and restenosis. According to this classification, a lesion with an extreme eccentricity and a length of 4.5 mm, as in our case, was considered to be in the latter group. If standard PTCBA only was attempted in the latter group, a higher morbidity and restenosis rate would be anticipated. Therefore, in order to avoid abrupt closure or symptomatic dissection and retain long-term patency, we made an attempt to apply a stent to the lesion in our patient. The gfx coronary stent has good flexibility and appropriate length (12 mm) to follow arterial tortuosities and can conform to vascular morphology. In addition, its crown-shaped struts with wide openings do not seem to occlude side branches, such as perforating arteries. We therefore decided to use the gfx stent. We also used the coronary balloon catheter (Ranger), which has good flexibility and trackability and an over-the-wire system for dilatation prior to stenting. Coronary artery stenting has been widely evaluated for the treatment of stenoses (7). Several articles have reported efficacy of bailout stenting after failed coronary angioplasty (1); however, no stent has been specifically designed for an intracranial atherosclerotic stenosis. Previous studies (8, 9) have reported the application and efficacy of other coronary metallic stents to an atherosclerotic petrous carotid artery. In addition, carotid artery stenting is currently being evaluated (10, 11). However, as far as we know, there is as yet no report of elective CAS for an atherosclerotic intracranial artery. CAS may prove to be a safe and useful means to resolve an intracranial atherosclerotic stenosis in similar situations. This initial result for CAS is encouraging and warrants further investigation. We thank Louise E. Johnstone, Department of Physiology, Kochi Medical School, for proofreading the manuscript. ↵1 Address reprint requests to Takahisa Mori, MD, PhD, Division of Neurological Endovascular Intervention, Department of Neurosurgery, Kochi Medical School Hospital, Kohasu, Okou-tyo, Nankoku City, Kochi 783–8505, Japan. Accepted after revision January 23, 1999.